What exactly is a Pinot Gris? It’s a dry white wine. It’s basically the same as a Pinot Grigio, but slightly different. Pinot Grigio is Italian. Pinot Gris is French. 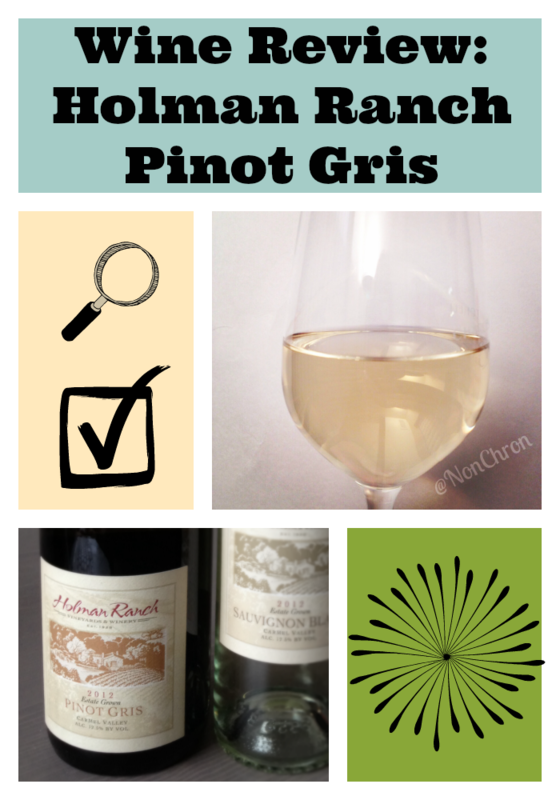 What did I think of the Holman Ranch Pinot Gris? It tasted slightly buttery, but not overly so. There was a little bite initially followed by a fruity, tart flavor. It was delicious, but I probably keep mine too cold. I never freeze it. That’s out of control and will probably ruin the wine, but I have been known to put cubes of ice in white wines…not this one, but other ones. It has a very light, dry palate with a clean finish. Not sweet at all. I’ve read how some Pinot Gris have spicy notes in them, but I can’t taste that in this wine. That’s not to say they aren’t in this wine…my palate likely needs to be refined or maybe my sinuses unplugged. My allergies are insane in Minnesota. What I like about Holman Ranch in general, is that they seem to specialize in different types of Pinot. Sure, they have Chardonnay and Sauvignon Blanc, but as far as reds go, it’s just Pinot Noir. Look at this map of their varietals. Personally, I think Pinot Gris and Pinot Grigio are great for people who want to drink white wines, but don’t like Chardonnay. The buttery in this wine is very light. After a couple of sips, I didn’t even taste it anymore. It’s very easy to drink, but then again, I sort of think most wines are drinkable…why drink them if they aren’t right? For $16, it’s a really good wine buy in my book. Before I looked up the price, I thought it was easily $10 higher than that. This is the third in a series of reviews I did on Holman Ranch wines. While I received the wines for free, I received no compensation. All thoughts are my own.